As a pop songwriter, Seth Swirsky has had some big-time cuts, like the oft-covered “Love Is a Beautiful Thing,” and he’s also authored three books about another of his passions, baseball. 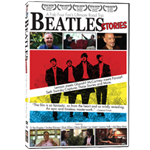 Now Swirsky has ventured into filmmaking to celebrate the 50th anniversary of EMI’s signing of the Beatles, releasing a video tribute to the band that started it all for him and millions of others, a documentary called Beatles Stories. Beatles Stories features snippets of interviews that Swirsky culled from traveling throughout America and Great Britain to find people who knew the Beatles, or, in some cases, people who never knew them at all but had something to say the group’s influence on the world. Highlights include a great interview with Graham Nash about being part of the “All You Need Is Love” satellite broadcast in 1967; the Monkees’ Davy Jones talking about being on the same Ed Sullivan episode as the Beatles; Beatles engineer Norman Smith discussing the band’s work (and later performing his hit “Babe, What Would You Say” in footage from the Tonight Show); longtime friend Klaus Voorman, who drew the cover for Revolver; and dozens of others, including producer Sir George Martin, who honestly believed that Norman Smith was dead, at least at the time of the interview. Smokey Robinson, Art Garfunkel, Brian Wilson – many of the greats, and some not-so-greats, weigh in here about their relationships with John, Paul, George and/or Ringo, and what the Beatles meant to them. Swirsky, who is obviously and unabashedly a novice behind the camera, does an incredible job of capturing their thoughts and emotions, probably because the subject matter is so close to his own heart. Swirsky was inspired to start this project in 2004 after performing at Liverpool’s Cavern Club himself, and anyone who’s a Beatles freak will tip their hat to him after watching this video. Unfortunately, some of the interviewees, including Smith, Jones, and Andrew “Lonely Boy” Gold, died before the project saw the light of day. But if they were still here one has to believe they would approve of the final product. It’s a Beatle-lover’s dream come true, with all kinds of cool information about the Fab Four that some surprising personalities aren’t afraid to talk about decades after the facts. The same way that a jazz lover has a copy of Miles Davis’ Kind of Blue in the house, no Beatles fanatic’s Fab Four collection will be complete without a copy of Beatles Stories. Swirsky has hit a home run with this production, which has been named an official selection of numerous international film festivals.